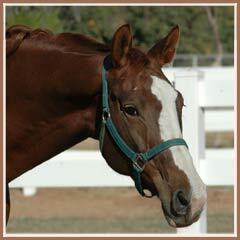 Padua was imported from Germany in October 2004, in foal to the outstanding Olympic competitor Askar AA. Inspected before coming to North America and while she was 7 months pregnant, Padua still managed an excellent score of 53.5, which makes her a Trakehner Verband Premium candidate. Padua's filly, Prada, was born late February 2005 and was even better than we had anticipated! 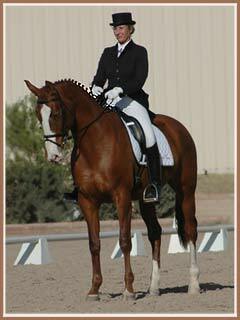 In September 2005, Padua was put to work under saddle by trainer Nadine Knüwer. 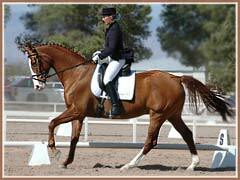 Padua has proven to be both a willing partner and a beautiful mover under saddle. The pair attended one schooling show where they took home first place ribbons in both of the classes entered and earned some of the highest scores of the day. 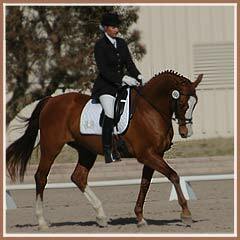 After their success at the schooling show, Nadine and Padua attended their first recognized Dressage show together on March 18, 2006. They placed 2nd in both of their classes despite a very cold and windy day! Padua had a gorgeous colt, Paladin by the ATA approved Arabian stallion Aul Magic on April 21, 2007! Padua is currently in foal to the successful eventing stallion Sonset's Sieger! Padua Go’s sire is the German elite stallion Maizauber, who has several approved sons in the breed, among them the two advanced level show jumpers Bel Espace Go and Humanus. The latter jumped internationally for the Bennetton Team in Italy and already made a name for himself as the sire of several premium daughters and perfoming offspring at advanced levels in show jumping. Maizauber’s other approved sons are the dressage stallion Amarant, the now Namibia-stationed Bellini Go, the State Stud stallion Harlem Go, the young Sturmklang and the now gelded Wolfsprinz. Maizauber’s career as a dressage horse took him to FEI levels; his offspring have followed him there and the most noteworthy one to North American dressage enthusiasts would be Lauren Sprieser’s Grand Prix horse Bellinger. Maizauber is a son of the prominent dressage sire EH Bartholdy, who was Champion of his approval in Neumünster in 1982, and sired the Champion 10 years later: EH Finely M. With the combination of Mahagoni and Pregel, two truly exceptional sires of the Trakehner breed, Maizauber offers proven bloodlines and has made a name for himself as a top brood mare sire in Europe. 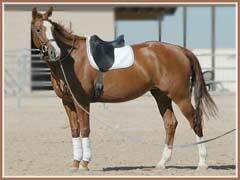 His dam line traces back to Trakehnen’s original Anglo Trakehner mare Martchen, a daughter of the Arabian stallion Harun al Raschid (also known as sire of the famous mare Kassette!). Martchen’s family branched into many smaller families, but overall, such stallions as Mohammed, Mahon, Meilenstein (sire of the ATA’s late Schönfeld *E*), Martini *Pg*E*, Mon Baron, EH Marduc, Magnet *E*, Maestro, Märchenstein, Merkur, Marlo, Magister, or Mumpitz come from this line. Padua’s dam Palma Nova is a successful brood mare for the Gorlo Stud in Westfalia. Her daughter Palmira Go (by Verdenas) is an active eventer in Switzerland; daughter Parana Go (full sister to Padua Go) is a premium mare in Germany. 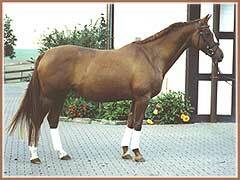 Dam sire Belluno was a successful S level dressage stallion and carried some very versatile and highly proven sport horse lines through his sire Rittersporn and the Polish Trakehner Mazagran. Padua’s second dam is the premium mare Palma II by Morgenglanz *E*, one of Germany’s most noteworthy model mares after WWII and winner of the prestigious DLG show. She founded a very versatile family that also came to North America in form of Palma Nigra *E*, her grand daughter (out of Passarge II). Palma Nigra has four approved sons with the ATA at this point. The family of Pelargonie is one of the most known from the main stud Trakehnen, and also produced the international dressage stallions EH Partout (A. van Grunsven) and Peron TSF (M. Gibson; Team Bronze at the Atlanta Olympics in 1996).